3 owners from new, last owner since 2010. 2 x keys, 2 x fobs, 2 x cobra touch keys. Original owners booklet, every MOT from new, all V5’s including the very original, basically a huge amount of paper work. Full service history with the service book fully stamped and pages added! 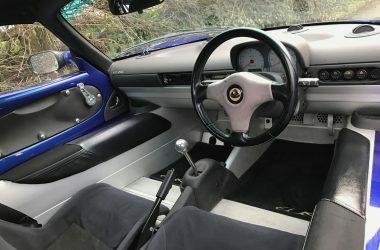 2000 1,942 miles – Hayden Daytune Ltd Lotus – After sales service. 2000 9,935 miles – Hayden Daytune Ltd Lotus – A service. 2001 18,367 miles – Storm of Leicester – A service. 2003 25,487 miles – MOT. 2003 26,689 miles – Orchard Lotus – B service. 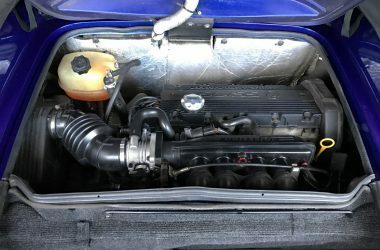 2004 28,770 miles – MOT. 2005 29,646 miles – MOT. 2006 30,401 miles – MOT. 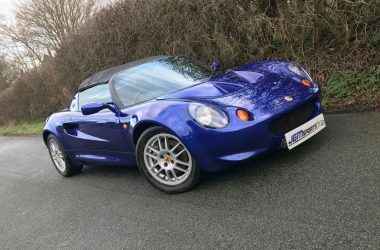 2006 30,481 miles – Stratstone Lotus – A service. 2007 30,624 miles – MOT. 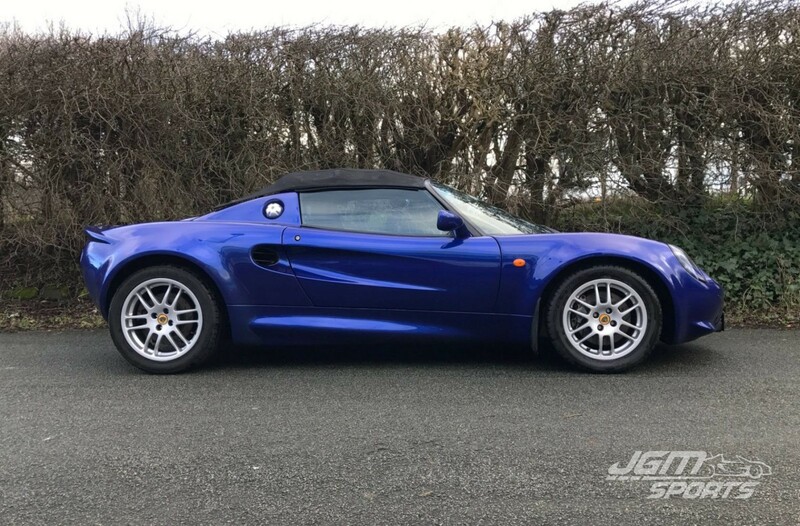 2007 31,560 miles – Topgear Automotive Lotus – C service (cambelt). 2008 39,362 miles – MOT. 2009 44,903 miles – Quantum Mechanics – A service. 2009 44,903 miles – MOT. 2010 47,693 miles – MOT. 2010 47,698 miles – Quantum Mechanics – A service. 2011 48,570 miles – MOT. 2012 48,742 miles – Quantum Mechanics – B service. 2012 49,390 miles – MOT. 2013 50,333 miles – MOT. 2013 50,362 miles – Quantum Mechanics – A service. 2014 51,134 miles – Qmech – A service. 2014 51,144 miles – MOT. 2015 51,717 miles – Qmech – C service (cambelt). 2015 51,718 miles – MOT. 2016 52,401 miles – Qmech – A service (December). 2017 52,414 miles – MOT. 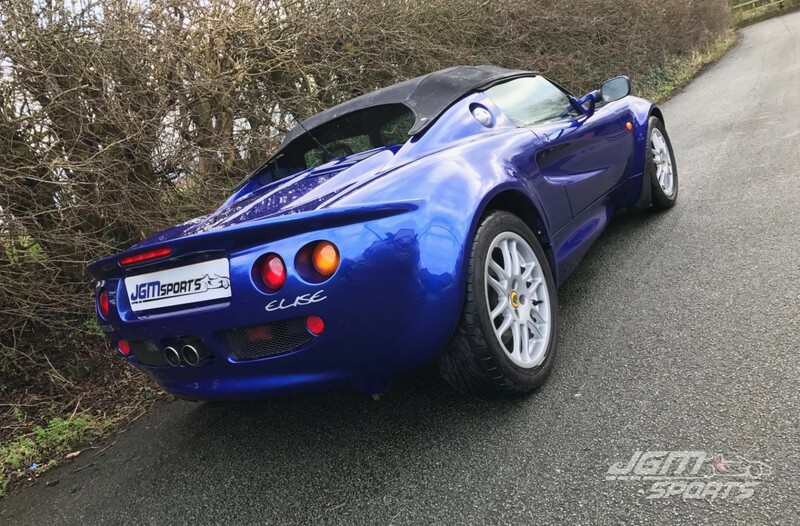 As you can see this Elise has done very little mileage recently due to the owner moving abroad with work. 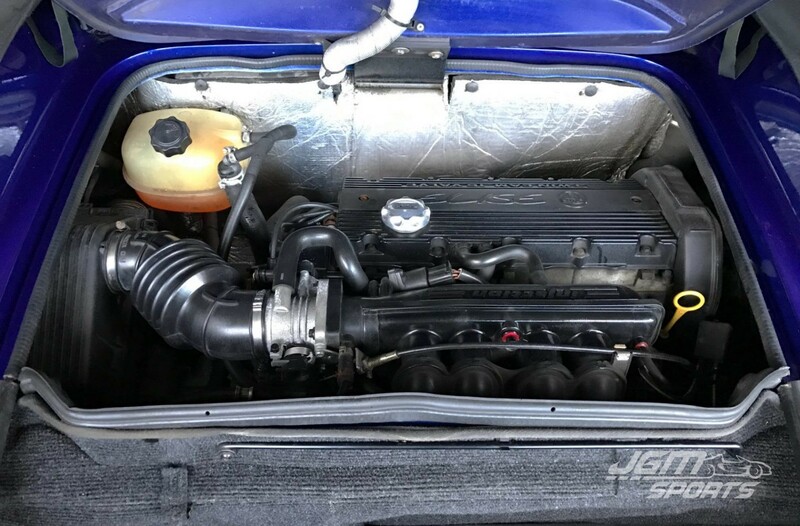 Dealer upgrade Janspeed sports exhaust. Elise parts quick shift kit. Exhaust down pipe and flexi replaced with stainless version. 4 x New Toyo Proxy T1R tyres. Cambelt changed less than 1,000 miles ago. Factory cloth seats and blue roof. Being one of the last S1 Elise’s it has the rimstock wheels, moulded in boot and headlight covers. Drives fantastic just how a fresh S1 should drive. Usual wear to the interiors drivers seat and stone chips to the front as to be expected. 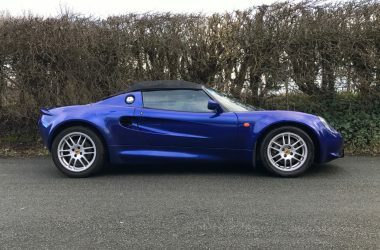 Apart from the above this Elise is in excellent condition and with a recent service, MOT and new tyres its ready to go.